Mark Rayner shows how easy it is to make a draughtproof outdoor candle holder. You will need: A drill with a 10mm drill bit, square terracotta pot saucer, square glass vase, glass pebbles and a paintbrush. Materials for this project were purchased from Mitre 10 Mega. 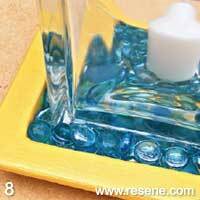 You could also make a round candle holder using a round pot saucer and round glass container, or use aquarium gravel or shells instead of glass pebbles. 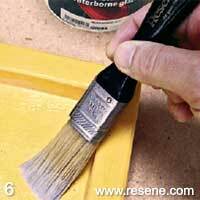 All paint products came from a Resene ColorShop. Resene Art Action Gold Effects, Resene Terracotta Sealer, Resene Testpot of Resene Lemoncello and Resene Concrete Clear. Note: So the flame doesn’t blow out, position the candle holder with the open side away from prevailing breezes, or on a table against a wall, as shown. 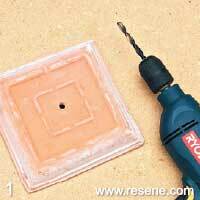 Drill a 10mm drainage hole in the middle of the terracotta saucer (this step isn’t necessary if your candle holder won’t be outside in wet weather). Thoroughly wash the pot saucer in warm soapy water and allow it to dry. 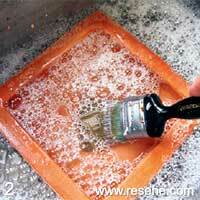 Apply one coat of Resene Terracotta Sealer to all sides of the pot saucer and allow it to dry. 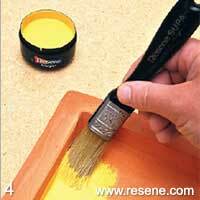 Apply two coats of Resene Lemoncello to the pot saucer, allowing two hours for each coat to dry. 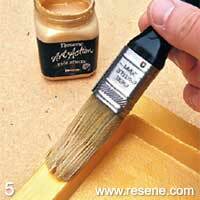 Using a dry brush, apply one light coat of Resene Art Action Gold Effect to the pot saucer, dabbing and brushing the paint on thinly so the base colour shows through. 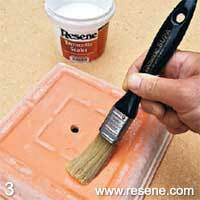 When the gold effect paint is dry, apply two coats of Resene Concrete Clear to the pot saucer, allowing two hours for each coat to dry. Place one layer of glass pebbles in the pot saucer, as shown. 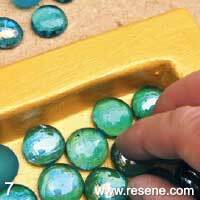 Ensure the pebbles are flat side down and that you keep the drainage hole clear. Sit the glass vase on its side. 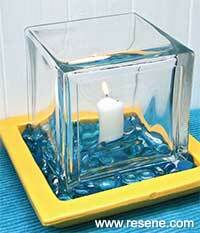 Place the candle in the centre and glass pebbles around its base. Stand the vase on the saucer and place a few glass pebbles around it.